Learn the ten essential principles of ethics for modern leaders. Told through candid stories from the field, Hilary helps leaders to cultivate a mindset and approach to leading that is genuinely compassionate yet action-oriented. The interactive exercises take insights to action so leaders can cultivate sustainable team dynamics and fuel exciting progress. Ethics sounds basic and simple enough; however, in practice, especially in the complex and often competitive environment of business, it can be difficult to really know what the most ethical action to take is and why. Throughout her time in the corporate world, Hilary found that ethical issues and misunderstandings are the most common obstacles to peace and progress. A lack of alignment around a universal ethical language for behavior resulted in confusion and interpersonal conflict. 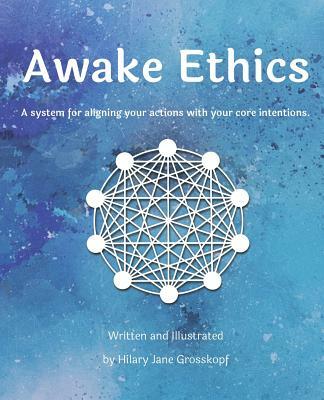 Awake Ethics is an ethical system for alignment, collaboration, and progress. The system is comprised of ten principles that help rising leaders cultivate peace and progress through action. By studying and practicing ten principles, based on an ancient system of ethical conduct, Hilary found that organizations could be environments where teams work harmoniously and enthusiastically while still remaining productive and efficient. Throughout the book, Hilary shows through personal stories and powerful visualizations how the ten principles, when put into practice, enable teams and organizations to grow and thrive sustainably. Leaders will learn how to apply the principles in practice and foster a team culture of peace and progress; two key aspects for collaboration and sustainable growth in all organizations.